During the past winter Catch 22 apparently sat down in her slip due to very strange weather patterns and broke off the port rudder. Now I have to drop that post to ship off for a new one to be built. Is there somewhere I can look up that explains how to drop the rudder? What all is involved? Any help would be greatly appreciated since the best I have been able to do is take a fair sized chunk of skin out of my hand and rub my knuckles raw. what model is catch 22? Catch 22 is a classic, with spade rudders and outboard motors. I think he meant a 32 or 36. I wondered how that happened. I've sat in the mud many times, but fortunately the stuff under my slip is very soft. Ouch. I would start soaking the quadrant with PB Blaster now. It looks fairly straightforward on the 32. If it won't come out, I would probably bend the frame straight, inspect closely for cracks, and fab it in place. Not best, but not terrible. A pair of rigid foam blanks, epoxy together, shape and fair, glass, and fair again. The bit near the hull is a drag, but you've got ~ 1/2-inch clearance. Pretty time consuming to do on-site, because of all the trips required. 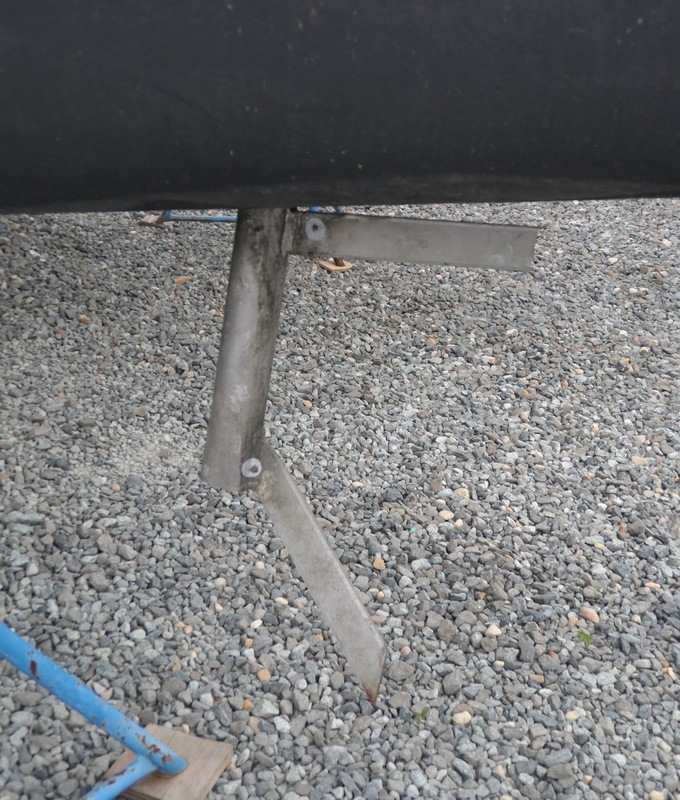 If your boat is blocked, you will need to dig a hole to allow the rudder to be removed. Remove the set screw(bolt) located on the quadrant and lower the rudder. In my case, the rudder was bent straight back, so I just drilled another hole in the rudder shaft a little higher to allow clearance between the rudder and hull. I did not notice any performance issues under way but replaced it later. Thanks for the info and suggestions. As near as we can tell, there was likely an old piling or log in the mud beneath her in the slip and she beat against with the extreme low tides we had this year. We are going to move her since the extreme tidal swings we are getting now seem to be here to stay. I have not seen a set screw unless it is the one at the top of the shaft. Once I get the quadrant lose I'm hoping it will be self evident. Thanks again for the info. I don't think you need to remove the quadrant to lower the rudder.